AJ: My name is Ajani Jones, I went to Thornton township high school in Harvey IL. I went to college to University of Iowa on a scholarship but then I transferred to Columbia to get back in tune with the movement here. AJ: I was nine when my mom would play Lauryn Hill, Jill Scott, etc. Neo Soul was really big at the time on the south side back in 2004, I remember that time feeling spiritually. My mom is my best friend and still is, she put me on to all of that music and it stuck. I remember when she bought Get Rich Or Die Tryin’, it was game over from there. AJ: I started on Audicity at 16 & I got into Logic at 17 – 19. Then my laptop got stolen when I was staying at Iowa over the summer and I didn’t have anything left to do but write the music you are hearing now. EM: What/who inspired you to become an emcee? EM: How would you describe your music to someone who has never listened before? AJ: Its for the kids, Neo Soul/Hip-hop. EM: Who are your top five biggest influences musically? EM: What are your top five favorite albums of all time? EM: What are your top five mixtapes? EM: What was the first album you ever bought? EM: What’s your favorite music video? EM: If you could collab with one person dead & alive who would it be? EM:I first discovered you because of your project Eternal Bliss, what was the process of creating that like? AJ: I made it really for women, from my experience of that year. I was trying to paint a Chicago summer with a ton of positive energy, ambition and marijuana smoke. EM: Can you speak on your relationship with producers Blookah, Quickly & Banks? AJ: I was recording in my homies bedroom and they sent us over some beats and I was instantly asking “How is this guy not famous”. He sent me a bunch of futuristic and wavy beats that I didn’t touch for a year or two, until I went back to them and created a whole project. I have been working very closely with Banks, he has engineered my last four projects & he’s producing a lot of my project this summer. EM: What is your relationship with Kiraly Payne? AJ: We linked because my step dad knows his mother, they put us in contact and we had a show together at Columbia last year. EM: Are there any local Chicago rappers that you have been listening to? EM: So you recently announced that you are working with Chicago’s own Closed Sessions, what convinced you to sign with them? 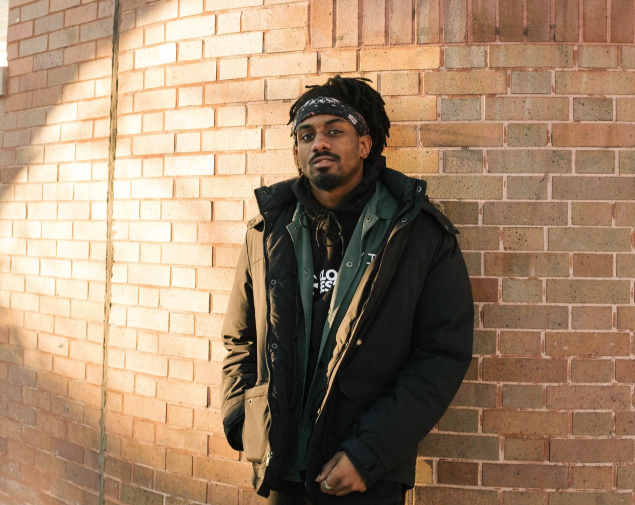 AJ: I have been following them since they had Alex Wiley, they did a great job building his career and they did it again with Kweku and others. I saw that they had the ability to help artists get to that next level with their resources, and they are fantastic with rolling out projects & have great PR. I moved back to Chicago from Iowa and told myself ” in two years I’m going to sign with Closed Sessions”, and it just so happened on the second year I did it”. EM: Along with the CS announcement you recently released a brand new EP titled “Cocoons”, can you speak on what the process of creating that was like. AJ: It was really dope, we met with CS & they asked us where we were at with the EP we said 20% but we were really at zero. I ended up completing the entire project in less than two months. We made like twenty records for the tape and picked the ones we thought fit best. It was dope & seamless, we are on a roll over at CS, everything is running smoothly. EM: Who are some Chicago rappers you want to work with in the future? EM: Who are some producers you want to work with in the future? EM: What can our readers expect from you for the rest of 2018? AJ: A project titled Dragonfly, it’s about me blooming & introducing myself to everybody. I will also be opening up for Kweku Collins on his west coast tour, which is my first tour so I am looking forward to it. AJ: A leader in the hip-hop community, leading the kids & giving out good vibrations.